As part of our weekly Autism Aware Quiet Evenings we are offering customers a calmer shopping environment and the security of knowing that additional assistance is available if necessary. We would also like to invite registered Irish autism charities to get in touch on csr@lidl.ie if they would like to promote their work and raise awareness of autism by speaking with Lidl colleagues and customers in stores nationwide during our Autism Aware Quiet Evenings. Building on this initiative, we teamed up with Assistance Dogs Northern Ireland (ADNI) and Autism Assistance Dogs Ireland (AADI) to put two dogs through training. The two dogs, named Yogi and Kyra, will be given to families of children with Autism in Ireland and Northern Ireland. These dogs will be trained to provide a steady influence for the child, especially in public and social situations. They will also be trained to meet the needs of both the child with Autism and their guardian/s. 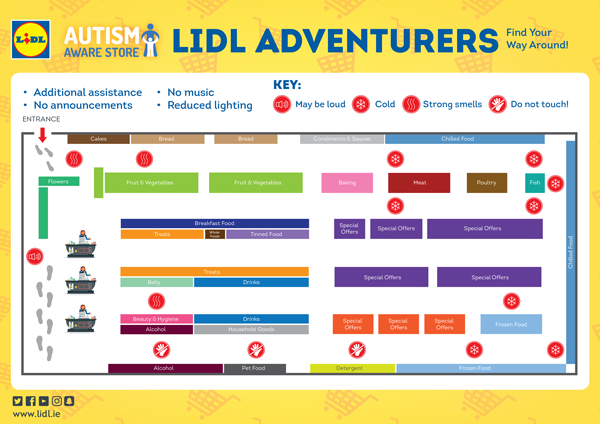 We have also prepared an in-store map and shopping list for children with autism to prepare and organise their shopping trip. Greenhills Road Greenhills Road, Dublin 12. Walkinstown Walkinstown Avenue, Walkinstown, Dublin 12.